The history of the Amerikalinjen dates back to the early 20th century, when the building served as the headquarters for the Den Norske Amerikalinje (Norwegian American Line). Founded in 1910, the Den Norske Amerikalinje operated as both a cruise line and a freight company that transported mail, cargo, and people from Norway to America. Den Norske Amerikalinje specifically ferried countless Norwegian immigrants to the United States who were in search of new opportunities. 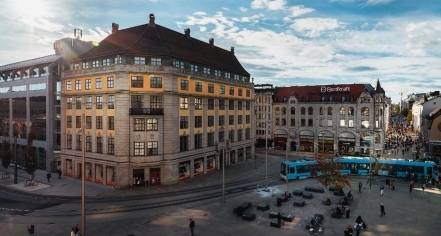 Due to its success, the company began looking for a location in the heart of Oslo to build a central headquarters. Den Norske Amerikalinje selected a site near the city’s harbor, and developed a beautiful, multi-storied building at the spot shortly thereafter. By 1919, the building, named the Amerikalinjen, was complete. Amerikalinjen is now a prominent boutique hotel nestled along Oslo’s majestic shoreline. 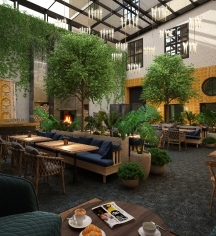 Opening in 2019 to celebrate the building’s centennial anniversary, the Amerikalinjen features 122 wonderful guestrooms and suites that honor its prestigious heritage. Amerikalinjen’s beautifully renovated accommodations provide a welcome retreat for those journeying through Oslo’s historic streets and canals. Each of the meticulously designed rooms features the finest modern amenities expected of any upscale boutique hotel, such as sumptuous bedding, lavishly furnished bathrooms, and complimentary refreshments. Whether guests desire a refreshing beverage or a substantial meal, the Amerikalinjen offers a lovely variety of dining options. Guests can feast at the exquisite, New York-style restaurant, Atlas Brasserie, or try one of the hotel’s historic cocktails at Pier 42. Gustave, Amerikalinjen’s exciting dance club, hosts thrilling live-jazz performances that carry on deep into the night. The newly-renovated meeting spaces are great for hosting any event, whether it be a birthday party or a business meeting. Haven possesses a relaxing courtyard that is well-suited for casual get-togethers, while the Gustav emits an electrifying atmosphere for lively parties. Amerikalinjen, a member of Historic Hotels Worldwide since 2018, dates back to 1919. The Amerikalinjen was originally the headquarters for the Norwegian American Line, which was once the largest shipping company in Norway. Airport Transportation: An airport shuttle is available through a third party. Cancellation Policy: The standard cancellation policy is 4:00 p.m. day of arrival. Cancellation or modification must be done before 4:00 p.m. to avoid a fee of one-night stay including tax. No-Show fee is one-night stay including tax. Some rate plans or packages have other cancellation policies - please see rate policy. Cribs and Pack-in-Plays: Available upon request for a 200 kroner fee. Deposit: All reservations must be guaranteed with a credit card valid on the day of arrival. Early Check-In/Late Check-Out: Available on request only and for a fee of 200 kroner per hour after check-out time. Extra Person Fees: 200 kroner per person. Hotel/Resort Fees & Taxes: 12% occupancy VAT is included per room, per night. 15% VAT food & beverage tax included per room, per night. Parking: Paid parking is available nearby. Payment: Visa, American Express, Diners Club, and EuroCard are accepted. Pet Policy: Pets are welcome on request for an extra charge of 400 kroner per night; maximum one pet in dedicated rooms. Rollaways: Available upon request for a 650 kroner charge. Learn more about the History of Amerikalinjen .